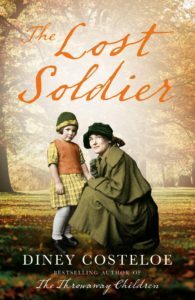 The Lost Soldier by Diney Costeloe is a marvellous contemporary and historical novel being set in both the first world war and 2001. It is a remarkable novel as facts are woven into fiction. It is the tale of a lost generation of men in the futility of war. Every man killed in battle had a name and a face. “He may be unknown but he gave his life as surely as did the others.” Journalist Rachel searches out the story behind the unknown soldier in the ash grove memorial.